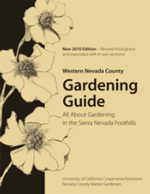 In an effort to help our community use resources wisely, we have included a number of publications and links to UCCE websites that are focused on watering efficiently in the landscpape. The best place to start is choosing the right plants for the right place. We have developed a plant list that can help get you started. We have also included a link to Firewise Landscaping.